It’s been the sort of class where, a lot of the time, after you leave the room, as the teacher, you feel obscurely broken down and sad, and then the feelings linger into the evening, and then they emerge again with the next class, or at most they get vaguely attenuated without dissipating. I actually do think my students have learned a number of important things about Europe (they had barely heard of Franco, or even of socialism), and their papers and homework show a lot of thinking and knowledge, but I don’t think they think they’re learning something. Instead, they largely feel disaffected about the whole endeavor. So this — how shall I put it? — this collective mood of detachment frowns down on the classroom as soon as I open my mouth. It just hasn’t gone away in months. Three major contexts played a role in the production of this dire teaching atmosphere. 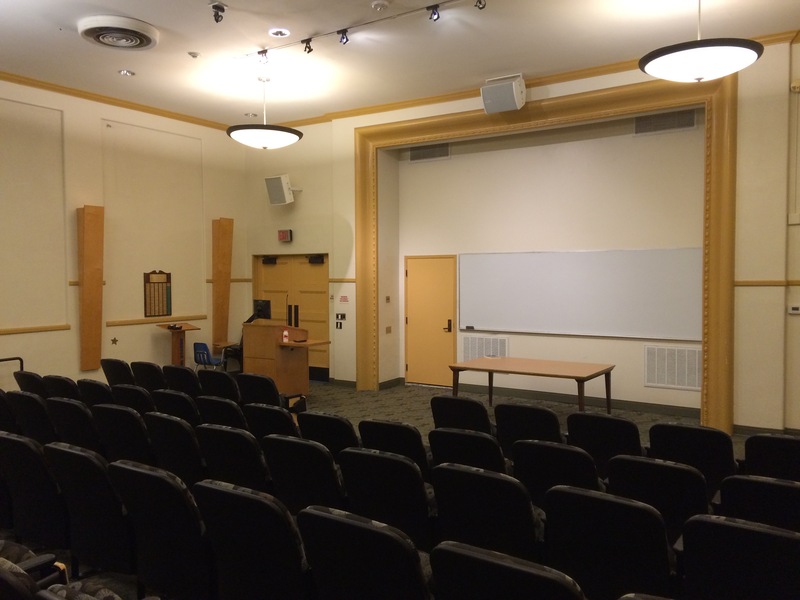 The room: at first they put the class in a huge lecture hall (see picture above), which pushed the first month of class into a quasi-lecture mode, discouraging conversation and fostering standardized disaffection. By the time we got a smaller room, all the bad group dynamics had already crystallized. My own ignorance of this student population: what they can read, what they can write, what they expect, how to give them instructions, how to get them involved in anything. It took weeks of trying various exercises and formats to find something that got the non-talkative students to be remotely engaged. The reality of disaffection: starting early on, it was clear that some students were going to be, well, much more engaged than others. From where I sit, the students fall into three general groups: the talkative, the shy, and the permanently disaffected. The talkative students are great and they do get engaged with the material, but they are a minority; I feel guilty for not having found ways to get the shy students more involved; and I feel outright frustrated by the students who more deliberately tune out. But I also really need these rationalizations, and I recognize that they are rationalizations, because it’s just so painful to have a class not go well. Admittedly, it doesn’t say in my job description that producing good moods is required. But somehow, it’s still there somewhere in the unwritten rules. Consequently, my sense of disappointment is also a sense of transgression. My grad school teacher Lauren Berlant says that bad teaching is inevitable (“like bad parenting”). My collaborator Charles Soulié from France told me once, after I visited his sociology classroom, that “uncertainty is a constant of the trade.” But the general doesn’t really redeem the particular (never has, never will). And I expect that I don’t need theoretical redemption here so much as a more developed reparative practice. Never making teaching mistakes would be good, but knowing how to fix mistakes would be better. Like in software development: most of the work consists of fixing your own mistakes, debugging weird behavior (whether by machines or organisms), getting things back on track. Or again as in music: you can make all kinds of technical mistakes as long as you don’t let the audience catch on. I mean, I don’t cry in the classroom; I have a performative face, of course. But I also don’t like leaving the room in so many shapes of sadness. So I suppose I also need better affective buffers against the reality of weird moods — which also seem to be a “constant of the trade.” To teach is to be permeated by your students’ moods. But that vulnerability isn’t always an asset. I really liked this essay and so much of it resonates with me, especially the part about how hard it is to connect when students don’t like reading. I have a sort of weird left-field suggestion of you are interested, that comes from my background doing democratic education with adults and also especially with children. I think what you wrote about the classroom itself is especially important, and one way of thinking about this is to think about the way that affect lives in bodies. Finding ways to change the ways that bodies inhabit the classroom can be a powerful way to support better affect for everyone. “Games for actors and non-actors” by Boal is the canonical “theater of the opressed” resource for physical exercises that can help students bring their bodies into the work of analyzing politics/history/etc. A lot of them feel really cheesy but sometimes cheesy is better than disaffected. I have found that moving around together helps people feel more trust and presence in an environment. Thanks, Lauren, “cheesy is better than disaffected” sounds like words to live by! There’s so much that’s shaped by how people hold their bodies, etc, it would be nice to try some of these exercises to interrupt the norms. I actually started out this class the first day by having the kids go outside the classroom on a sort of cultural scavenger hunt, but I never came up with a good reason to do that again, alas.